Passionate winemakers and a bounty of sunny days and cool nights support Grand Valley’s thriving wine country, which encompasses more than 20 wineries and vineyards. One of the best ways to explore wineries in the Palisade and Grand Junction area is on two wheels — here’s how to make the most of your tasting tour. Make it a multi-day affair. Rent a bike from a local outfitter. The friendly experts at local bike shops will not only set you up with a reliable ride, but they can also supply guidance on all the best wine-tasting routes (maps are also available at the Grand Junction Visitor Center). Rapid Creek Cycles in downtown Palisade offers maps highlighting local wineries and orchards and rentals of seven-speed cruisers with baskets perfect for hauling goodies like bottles of wine and produce you pick up along the way. There are also several bike shops in Grand Junction, like Brown Cycles, plus many others ready to help with your two-wheeled adventures. 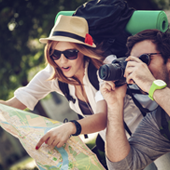 Plan your trip around an awesome event or festival in Palisade. Hop on the Fruit and Wine Byway. 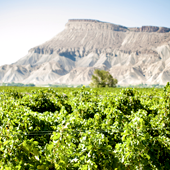 The Fruit and Wine Byway starts in downtown Palisade, includes three different routes ranging from 5- to 25-miles long and leads to more than 30 stops, including wineries, fruit stands, farms and orchards. The byway also cruises along the scenic Colorado River, offering unparalleled views of the Grand Mesa and Grand Valley. Book a guided tasting tour with Palisade Wine Country Float Trips to drift down the Colorado River to different vineyards and orchards (April to October); or rent a raft, kayak or canoe to embark on your own adventure.